Saleem Shaikh, Abdur Rahman Al-Atram, Sachdeva Harleen. Sturge- weber syndrome is a neurocutaneous disorder caused by persistence of transitory primordial arteriovenous connection of the foetal intracranial vasculature. It manifests with vascular malformations involving the brain, eye and skin with resulting neurological and orbital manifestations. Port wine stain, glaucoma and seizures are some of the commonly seen symptoms, depending on the presence of these features sturge weber syndrome has been classified by Roach into three types. We report a case of a 26 year old female with facial portwine stain and minimal neurologic manifestations, which according to Roachs classification falls in type II category. This report also underlines the need for detailed laboratory and neurologic work up of all patients with facial portwine stain present along the distribution of trigeminal nerve, as the neurologic manifestations in sturgeweber syndrome may vary in severity from seizures and mental retardation to minimal radiographic changes. It also emphasizes the need for identification of such rare variants of this syndrome. Saleem Shaikh, Abdur Rahman Al-Atram, Sachdeva Harleen. Roachs Type II Variant of Sturge  Weber Syndrome: A Case Report. Majmaah J Heal Sci. 2013; 1(1): 71-76. Saleem Shaikh, Abdur Rahman Al-Atram, Sachdeva Harleen. Roachs Type II Variant of Sturge  Weber Syndrome: A Case Report. http://www.mjhs-mu.org/?mno=287974 [Access: April 20, 2019]. Saleem Shaikh, Abdur Rahman Al-Atram, Sachdeva Harleen. Roachs Type II Variant of Sturge  Weber Syndrome: A Case Report. Majmaah J Heal Sci. (2013), [cited April 20, 2019]; 1(1): 71-76. Saleem Shaikh, Abdur Rahman Al-Atram, Sachdeva Harleen (2013) Roachs Type II Variant of Sturge  Weber Syndrome: A Case Report. Majmaah J Heal Sci, 1 (1), 71-76. Saleem Shaikh, Abdur Rahman Al-Atram, Sachdeva Harleen. 2013. Roachs Type II Variant of Sturge  Weber Syndrome: A Case Report. Majmaah Journal of Health Sciences, 1 (1), 71-76. Saleem Shaikh, Abdur Rahman Al-Atram, Sachdeva Harleen. "Roachs Type II Variant of Sturge  Weber Syndrome: A Case Report." Majmaah Journal of Health Sciences 1 (2013), 71-76. Saleem Shaikh, Abdur Rahman Al-Atram, Sachdeva Harleen. "Roachs Type II Variant of Sturge  Weber Syndrome: A Case Report." 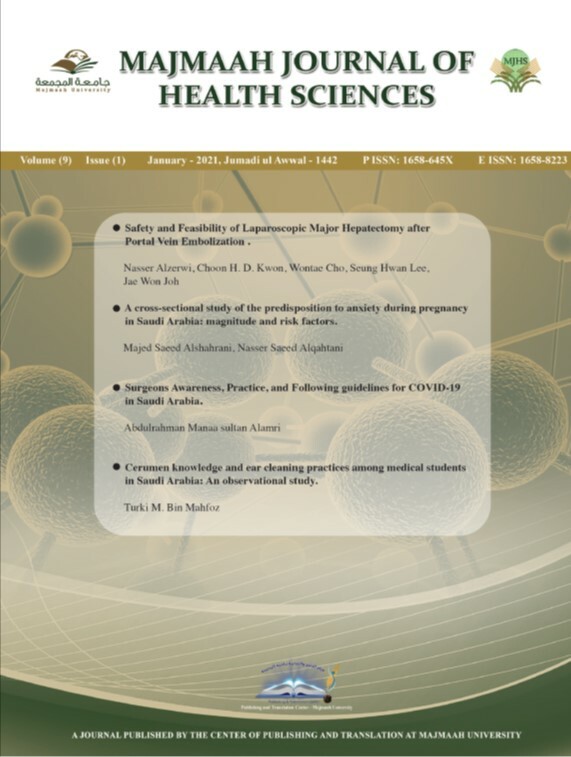 Majmaah Journal of Health Sciences 1.1 (2013), 71-76. Print. Saleem Shaikh, Abdur Rahman Al-Atram, Sachdeva Harleen (2013) Roachs Type II Variant of Sturge  Weber Syndrome: A Case Report. Majmaah Journal of Health Sciences, 1 (1), 71-76. Majmaah J Heal Sci. Year: 2013, Volume: 1, Issue: 1: 71-76.